This remote has change able buttons to label the remote to suit your system. 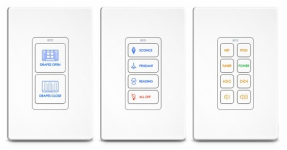 It has 8 different programmable full function options and 4 other source control buttons. Perfect for a smaller simple system. This remote will operate anything you would like as long as it is controlled by an IR remote control. package get this remote to work off a radio frequency. What this means is you can hide all of your electronics behind closed doors and still operate everything seamlessly. Also if you had speakers outside you could control it from that same area without having to go back inside and change the volume because the remote works almost everywhere in your home........depending on the size of your home of course. TOUCH SCREEN UNIVERSAL CONTROL My most Popular Remote! 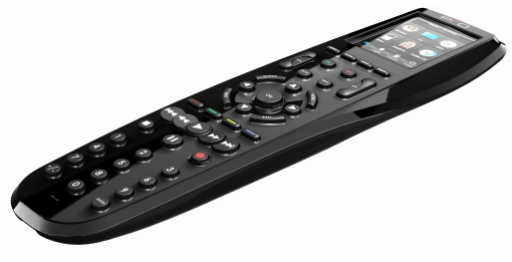 This remote does everything and more the T1B does and much more. It allows you to control more things then the T1B it also allows to create very specific buttons that will be labeled to suit each individual's needs. With the touch screen I can program in exact labels needed, and because it is touch screen I can create pages with your favorite channels and you can touch it and it will go straight to it instead of punching it in....or hitting the TV guide. It works off of IR as well as the RF upgrade-able option. This is a very affordable way to make your TV sound system look like a million bucks, and you don't need a university degree to operate it. These in wall options are usually used in your extra music zones, this way you don't need to look for the remote etc., depending on what you want to do........but these buttons will be able to operate the system from the location needed. Each button can be labelled appropriately so you can operate your system as easy as possible. About Pro Control Nothing Else Comes Remotely Close Pro Control is a division of Remote Technologies Inc., an award-winning manufacturer of innovative home control products for nearly 20 years. Combining advanced capabilities with unprecedented value, Pro Control programmable remote controls, professional-grade control systems and accessories provide the ultimate control solution for professionally installed entertainment systems. In 2011 the Pro Control Pro24.z remote and Pro Link.z processor received Custom Retailer magazine’s EXCITE Award in recognition of their innovation and high performance.